We are now working towards understanding the causes of cognitive decline and dementia, building capacity in dementia care and supporting Aboriginal family carers, and developing culturally appropriate strategies to promote healthy brain ageing. The next decade will see a dramatic increase in the number and proportion of older people within the Aboriginal and Torres Strait Islander population. Close to 80% of these older people live in regional and urban parts of Australia (a third in our major cities). 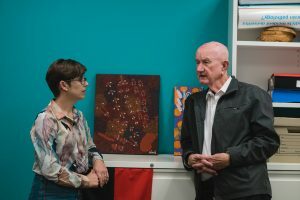 Recently, the Koori Growing Old Well Study (KGOWS) has shown that dementia prevalence in Aboriginal Australians across NSW is three times higher than the overall Australian population, at ages 60 years and older. high rates of dementia from remote Aboriginal communities and highlights the widespread burden of dementia and the need for culturally responsive approaches to dementia education, care and prevention. What is it that helps one person age successfully, and causes another to develop age-related diseases like dementia? Scientifically, we know too little about normal ageing and what factors influence some people, and not others, to develop diseases that affect the brain. Only by studying healthy elderly people, as well as those with problems, can we know what normal ageing looks like and learn more about staying healthy as we age. In collaboration with our Aboriginal community partners, our rigorous population-based approach allows us to accurately assess the prevalence of dementia, not just those already ‘in the system’ seeking treatment or care. Alzheimer’s disease was the most common type of dementia diagnosed, followed by vascular dementia – a pattern seen across older populations worldwide. Our Aboriginal health and ageing team, with our collaborators, is now conducting a follow-up study (KGOWS-II) to determine the social and biomedical risk and protective factors for dementia across the lifespan. In 2016, we also initiated the Koori Active and Healthy Ageing Project. This research will develop effective, culturally appropriate, and accessible strategies to promote vitality and healthy brain ageing and prevent dementia in Aboriginal communities. This research is supported by our ongoing Koori Dementia Care Project, which aims to build capacity in dementia understanding and care with Aboriginal community controlled and mainstream service providers. As one of our older Aboriginal participants observed: “Healthy ageing is your mind staying young”. Most Australians would agree.